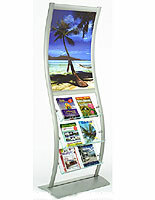 p> This silver 3-shelf leaflet stand is part of the versatile Forte line of modular design literature racks and frames. 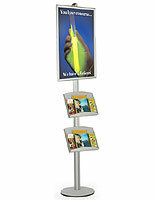 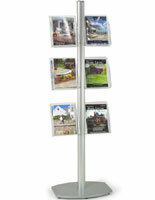 Each freestanding brochure holder features dual mounting channels and can be used as a single or double-sided fixture. 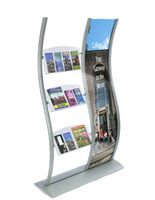 The stylish aluminum 3-shelf leaflet stand comes with three divided shelves, each with four pockets sized to hold up to 4" x 9" flyers or trifolds. 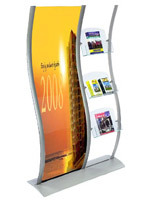 The modular design allows each freestanding literature rack to be configured as needed for a custom look. 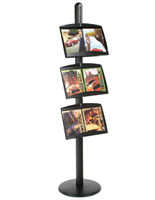 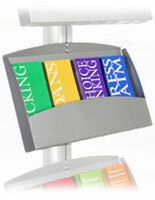 This customizable leaflet stand is ideal for use in busy public areas such as lobbies, concourses and waiting rooms. 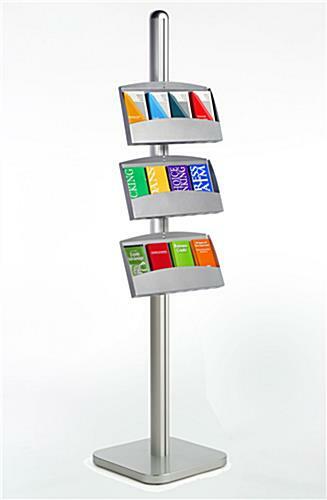 The 75" tall fixture with 12 separate brochure pockets is a perfect accessory to help keep high traffic displays organized without impeding accessibility. 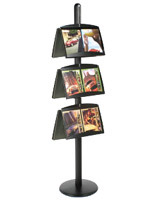 18.0" x 76.0" x 17.5"
4.3" x 9.3" x 1.5"